Challenge Your Fishing Skills on Both Pacific & Caribbean Coast! 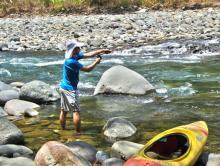 This package will let you conquer four of Costa Rica’s fly fishing venues in one single trip. You’ll fly fish for tarpon on the Caribbean Coast, machaca and rainbow bass on Lake Arenal, and billfish on the Pacific Coast, and then spend a day fly fishing on a jungle river for a variety of freshwater species. This package will amaze you with its natural beauty & diversity and will challenge you with the different venues and species. Fly into San José, Costa Rica, where you will be met inside the airport and taken right to your waiting private transfer. You’ll spend your first night here in the capital city at the Hilton Garden Inn La Sabana. Located downtown and across from the main central park, this hotel offers spectacular views of the city, a gym, and a rooftop pool for your first night in Costa Rica. You will be picked up in the morning for your 30-minute flight to Tortuguero on the northeast Caribbean Coast. Although Costa Rica is famous for its sportfishing, the Caribbean Coast and its giant tarpon are often overlooked. After you check in to your hotel and change, you will head out for your first day of fishing with our local tarpon guide, Primo. After fishing, you’ll head to your hotel, the Aninga Lodge, which has 32 bungalows and an incredible turtle-shaped pool to enjoy. 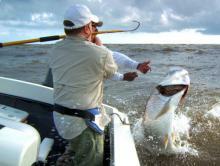 Full days of fly fishing for tarpon with your private guide and local expert. Primo grew up in the area and has been fishing for over 20 years, so he’ll give you every opportunity to present your fly to the ‘silver king’. Although some days it is easy to see them rolling in huge numbers, landing tarpon on a fly rod is one of the most challenging things an angler can do. Their bony mouths, acrobatic jumps, and sharp gills make landing a tarpon one of the last things a fly fishermen checks off his bucket list. You’ll transfer by boat out of Tortuguero then by van to the north central part of the country and the Arenal Volcano. Here you’ll stay at the Arenal Manoa, where you will have great views of the imposing volcano right from your room. 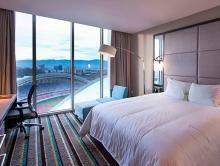 This hotel features 80 junior suites, a nice restaurant, two thermal pools, and a swim-up bar. Head out on Costa Rica’s largest fresh water lake, Lake Arenal, for a day of fishing with one of the country’s best anglers – Tirsio Hidalgo. Tirsio is local to the area and is hands-down the best guide on the lake. With over 25 years experience, he can take you to all of the best corners and river mouths that hide in the 33-square-mile lake. Fish for tilapia, mojarra, the delicious rainbow bass, and the aggressive machaca – or mini tarpon. You will take a private air-conditioned transfer down to Manuel Antonio on the Pacific Coast for the final leg of your fly fishing vacation. Here you’ll stay in a private bungalow on the spectacular 33-acre Tulemar property which features rainforest, three pools, a new spa, and its own private beach. This day is used to travel across the country and give you a down day between fishing trips. During the drive, you’ll experience the change in landscapes and climate that make this country the tropical paradise it is. Now it’s time for your next challenge – billfish. 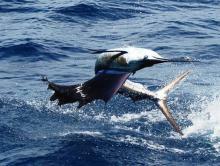 Today you’ll run off-shore for a full day of fly fishing for marlin and sailfish. 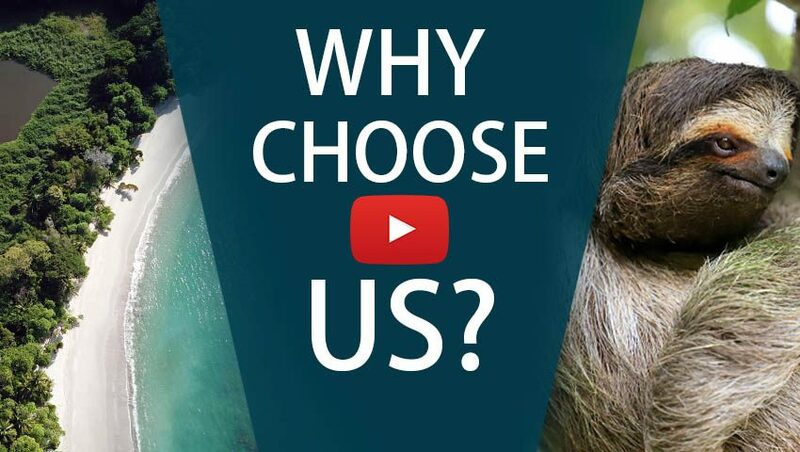 Even being able to have the opportunity to present your fly to a billfish all depends on having a capable and experienced fly fishing crew, and we have just that. 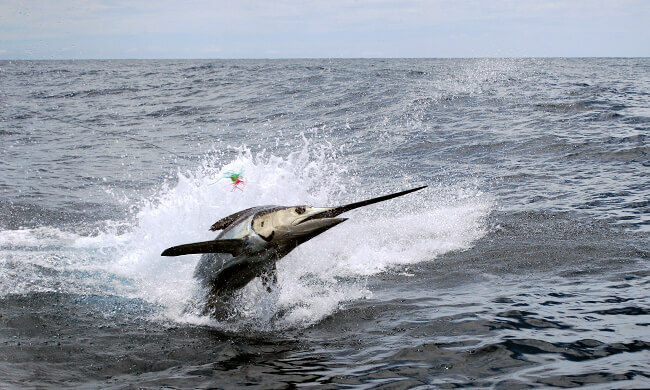 With over 30 years of experience and 4 IGFA records under their belts, our guys will be sure to give you the chance to cast to a trophy billfish – but landing it is up to you! Relax and enjoy the beach or let us take you on the canopy zip line tour! Try something different today and head out on one of our freshwater rivers for a day of fly fishing in the middle of the jungle. Your guide, originally a fly fishing guide from Colorado, will float you down the Savegre or Naranjo Rivers while you cast towards the shoreline and in eddies in hopes of landing roncador, grunts, machaca, and even snook or snapper. Nicknamed “the float of 1,000 casts”, the natural beauty and diversity that you’ll see will be an unforgettable experience. Head back out for another day of fly fishing for marlin and sailfish. Our boats participate in the annual fly fishing tournament so they know how to get the beasts within reach so you can present your fly. With tired arms, a slight sunburn, and hopefully a camera full of pictures, you’ll fly 30 minutes back to the SJO International Airport for your flight home. 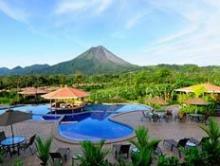 The charming Hotel Arenal Manoa provides great views of the Arenal Volcano. The Arenal Manoa is a large, service-oriented property with various amenities like swimming pools, spa, and small farm on site.